Playful, fun and magical. It's time for a Unicorn Blanket Party! Moms and grandmothers know this unique blanket is a total winner. Exclusively from the Rows of Throws® boutique series comes the adorable, upscale, hooded, wearable unicorn blanket for kids ages 5+. Very durable and crafted from 100% tight knitted, hypoallergenic, acrylic yarn. Arrives gift ready ribbon wrapped saving you time and money. Great for sleepovers, play time, nap time, snuggle time and story time. Makes a perfect holiday or birthday party gift for kids obsessed with unicorns. Playful, fun and magical. It's time for a Unicorn Blanket Party! 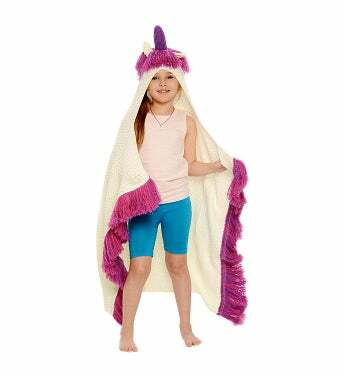 Here comes the adorable, upscale, hooded, wearable unicorn blanket for kids ages 5-10.